First thing’s first: Cuba ain’t Indo, coño. But the country’s emergence from more than half a century of reclusiveness may be its saving grace. Compared to other island nations in the Caribbean, Cuba is huge. Think Tennessee in land mass, surrounded by ocean—over 3.5 thousand miles of coastline. Bottom line, when it comes to surf, Cuba is a bastion of unexplored possibilities. Pair that with friendly hospitable people, classic cars galore, and a little Caribbean rhythm, and you’re in for an amazing trip. Scoring some fun waves would just be the icing on the mojito. Forget what you’ve heard, though. This isn’t your daddy’s Cuba. Don’t get me wrong. Communism – or more specifically la Revolución – is still alive and well. But the country’s insular qualities began to dissolve as early as the 1990s, after the Soviet collapse. From then on, tourism became a major economic driver, attracting mostly Europeans and Canadians. All this to say: if you visit Havana, don’t be surprised if you see a cruise ship or two. And in the last few years policies for small businesses have loosened, meaning a burgeoning selection of restaurants (or paladares) have sprung up across the country. Restaurants like Doña Eutimia in Havana are now serving up Cuban classics like Ropa Vieja with flair, requiring advance reservations; a far cry from the rationed cans of vegetables, beans, and rice of yesteryear. 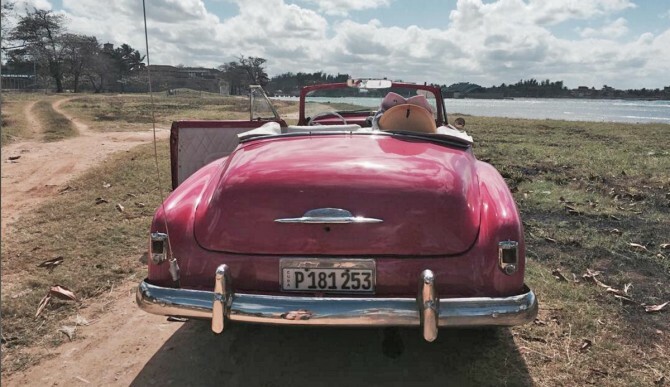 For Americans, getting to Cuba at the moment is tricky. There are roundabout ways (just Google search it) if you can’t get a visa. Visas from Uncle Sam are mainly reserved for Cubans with family on the island, or students. But the winds of change are blowing, and if you’re not into “breaking the law” you may only need to sit tight for a short while. Flying to Cuba, you’ve got two main points of entry: Havana to the northwest extreme, or Santiago de Cuba to the southeast extreme. Both cities are coastal and metropolitan: Havana, the capitol and Santiago, the second most populous city with a rich African heritage. Choose wisely, because it’s an 11-hour car ride from one to the other. Cuba’s big, remember? You could spend days exploring both cities, and honestly you probably should. Soak in the colonial architecture. Toss back a few mojitos—Cohiba in hand—and watch locals play match after match of dominoes as the Spanish guitars and African drums echo through the streets. Then, when you’ve soaked it all in, rent a car and go for a surf check. In Havana, depending on the season, there may actually be meager offerings straight out from the Malecón, the iconic seaside promenade that skirts the city. But the area with the most untapped potential is the north easternmost part of the island, the coasts of the provinces of Holguín and Guantanamo (especially the town of Baracoa). These areas have the best exposure to what the North Atlantic has to offer, and are virtually unexplored. In the early days of pioneer surf travel, the dream was to discover perfect waves, warm water, and no crowds. With the onset of sophisticated surf forecasting, digital maps and GPS, and accessibility of air travel, the number of unexplored surf breaks of the world has diminished over the years. Not to mention popular breaks in Indonesia, Mexico, Puerto Rico, and elsewhere that were once so secret have now been inundated with tourists. So it’s ironic that such a large island just 90 miles south of the U.S. would have such untapped surf potential. The bottom line is, we really don’t know how great Cuba can truly get. It’s unchartered territory. And that’s the most exciting part. For more information check out havanasurf-cuba.com, who produced the video above.